So General Electric is going Lean? It’s exciting to hear they have hired Eric Ries as a consultant to shake up the emphasis on Six Sigma. If you’re a Manager Tools fan some of the changes at GE simply match good management. That’s right: It shouldn’t take 5 months to write your annual review. And yes, the annual review shouldn’t be the linch-pin in your performance management system. You should be getting regular, quick, fine-grained performance insight from your manager and your peers. See Feedback and Peer Feedback. I chuckled a bit at the comment from Janis Semper saying, “It’s not realistic to expect perfection anymore.” Anymore? Yeah, we should always have high standards. We should be disappointed when we miss them. And managers should know their people aren’t going to be perfect. I actually interviewed a guy that said he had a perfect track record over decades in software of always hitting every deadline with quality. Maybe it’s me, but that actually made me trust him less. Perfection requires artificiality. (See Ian Malcolm, Jurassic Park — the book, not the movie.) You can’t really hit it. And if you do, how low are your goals? It’s great to hear GE will be considering giving incentives closer to the time of performance. No more home-runs in February that have to wait until next January for a raise — or similar. Offering managers the ability to give their employees time off as a reward? That sounds a bit like HR officially blessing what managers are already doing for their people. But I’ve never worked there. Maybe managers really don’t feel they could do that there already. Overall, GE’s emphasis on learning and improving faster is a great application of Lean principles, and plain old management feedback. On a snarky note: the peer feedback via a tool sounds just like what engineers would do. “I want to tell Bob he did a great job here, and might want to change this over here. If only I had a mobile application so that I could type that up and send it to him.” Yeah, what about just briefly and respectfully chatting with Bob? It sounds like the mobile app’s real purpose is to achieve that ever elusive holy grail of performance management: managing my boss. That’s right, the company is encouraging employees to give feedback to their bosses via the app. And employees are reluctant to do that. Rightly so. A good manager has a relationship with his directs that allows them to give “insights” to him. But it’s naïve to assume that all of the managers in a company have that relationship. A program that pushes all employees to speak to bosses with an expectation that they will always be heard, never subtly penalized, and that the boss will change her behavior… a bridge too far. Yeah, that’s not going to work. Not unless the process involves the boss’ boss. A group of directs can’t manage their boss. And even if it happens once, it’s not reproducible. If you want the state of management to improve in a company then directors have to manage their managers for it. You can’t delegate that to the individual contributors. So, yes. Please adopt lean. Please give regular feedback, not just once a year. Please collect information on how management can change. Don’t promise that a group can change their manager on their own. Waking up in my own bed again after two days in Palo Alto for the Manager Tools training on DISC (Effective Communications Conference — ECC) and interviewing (Effective Interviewer Conference — EIC). Bottom Line: I recommend them, both. The setting was intimate. There were 11 attendees the first day and seven the second. In a group so small with high-energy interactive training it is easy to become intimidated or threatened. Our instructors, Dani and Sarah, managed that very well by keeping it professional and low-key. When I say, “professional” I mean Dani and Sarah stayed on their feet with clear voices, clear speech, varied tone and examples to make sure the subject matter was thoroughly explained and engaging. Every question was welcomed and answered thoroughly while staying fanatically on-time. Dani and Sarah went out of their way to make me feel welcome. Each of them introduced themselves to me individually during early breaks in the conference. They made some small talk about things I mentioned in my brief attendee introduction. They took time to connect with me personally without making me feel processed. I’m not naturally good at meeting new people. I had a goal to meet as many new people at the conference as I could. Dani and Sarah made that easy and I felt a genuine rapport with them. A great deal of the conference material is covered in the free Manager-Tools.com podcasts. If you have limited resources you can go a long way through free (as in beer) self study. If you do have the chance to come to the conference I recommend it. You will hear things in person that you would gloss over in the podcasts. You will meet people that you want to meet. (That’s attendees and presenters.) These people share some important interests with you and you’ll be enriched by knowing them. I myself have been a long term Manager-Tools.com listener. I started listening for free in 2010 because I knew my manager was listening to them. That became a great way to learn good things and connect with my manager. I bought a personal license in late 2012 because I was applying for a management position and I wanted to be able to visually scan and review the show notes. This did a lot to prepare me for the interviews. In late December 2015 my current manager identified funds to send us both to ECC and EIC. The January conference dates conflicted with a cornea transplant that I had to schedule six months in advance. I was motivated enough to get there that I moved my cornea transplant up by 16 days so that I could be out of the two weeks of post-op recovery and attend. No, it’s not magic. Neither is Apple, or the Super Bowl, or anything else that has fan boys. But I’m definitely a fan. I hope you’re rockin’ two ties today, just like me! Just kidding. I totally took those ties off. Unless… if you’re wearing two ties right now then, I guess… I am, too. I’m back from my mountain-top experience. Almost a week, now. The training made a bigger impact on me than the material itself could do. The caliber of the instructors and attendees, along with the unique setting built up an experience that exceeds the models and thoughts of the course author. I’ve taken it easy reintegrating with my life. I’m not listening to as many news articles and books, yet. I’m trying to make room for a piece of the mountaintop to take hold in my Salt Lake Valley life-style. It feels good to hold back a bit on all my habits this week. Too often I encounter something inspiring and rush on to the next thing. We must create patterns of delivery in our lives. But life’s richness comes from the experiences that make you pause. I was going to write an article today, but I’m too high. In fact, this is my second day living out of a trailer at 9,000 feet while I attend an immersive, 6-day leadership training in the Uintah Mountains. I’m spending about 10 hours a day in leadership training. In the evenings I meet back with my family at the trailer. They’re here, too. My daughter, Emma, is old enough to attend her own week-long leadership camp. I won’t see her again until Friday. The rest are wearing my wife out getting dirty or doing crafts. I’ll debrief my wife Sunday and tell you later if the family version of this training was a good idea. You might think we’re learning about wood-craft and orienteering. Well, we’re in the woods. So there’s an element of that. For more details about the business content of these trainings see woodbadge.ws/employer. I have to admit, my original motivation for signing up for this course was mostly to shut up the people that keep telling me that I just have to go. Now, I’m glad I’m here. I was surprised to hear where the material comes from. I’m excited by the authors we’re hearing from and that I can include my family. 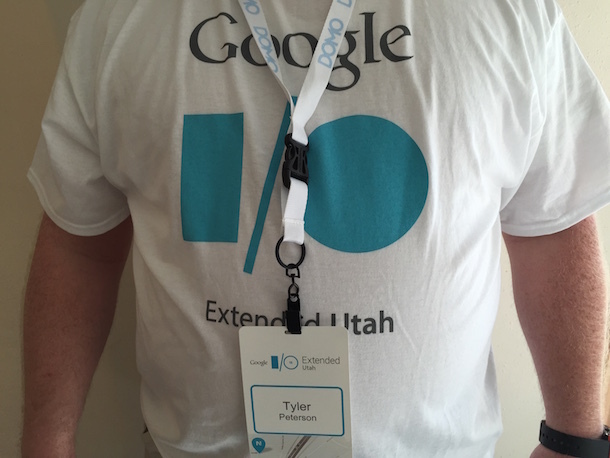 I just finished up the second day of Google IO Extended Utah. During the conference my friends and I noticed that little slips of paper with cryptic messages were in our goody bags. Playing with the information on the slips we found a code challenge system called foobar. Looks like it is by invitation only. When you beat level 2 you are given a single use link for referring others into the system. 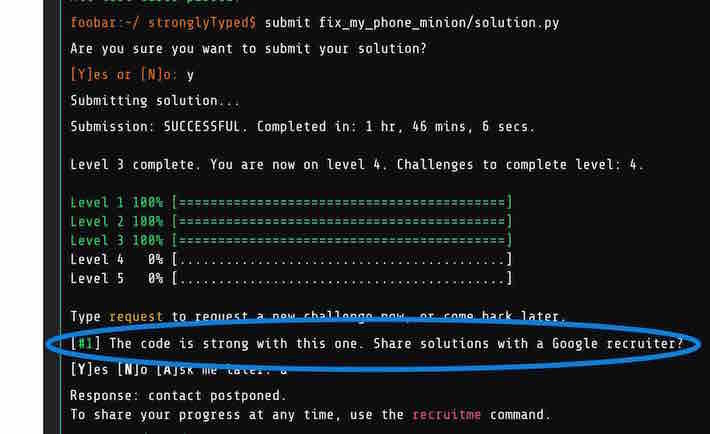 [#1] The code is strong with this one. Share solutions with a Google recruiter? As a hiring manager I think this is genius! I’ve used code challenges during the hiring process and reading someone’s code is very illustrative. What’s more, the time limits in the challenge system are very generous and allow the applicant to really shine. My employer puts on a large conference every year and I’ve wondered why we don’t do more to use it for low-key recruiting like this. If this technique is over-played then people may become wary of sending their people to conferences since it gives them even more exposure to the competition’s recruiters. In this case what Google is doing is very classy and low-key. If you went to IO and overlooked those slips then give it another shot. If you know someone that went, see if you can get them to refer you. The challenges are fun! 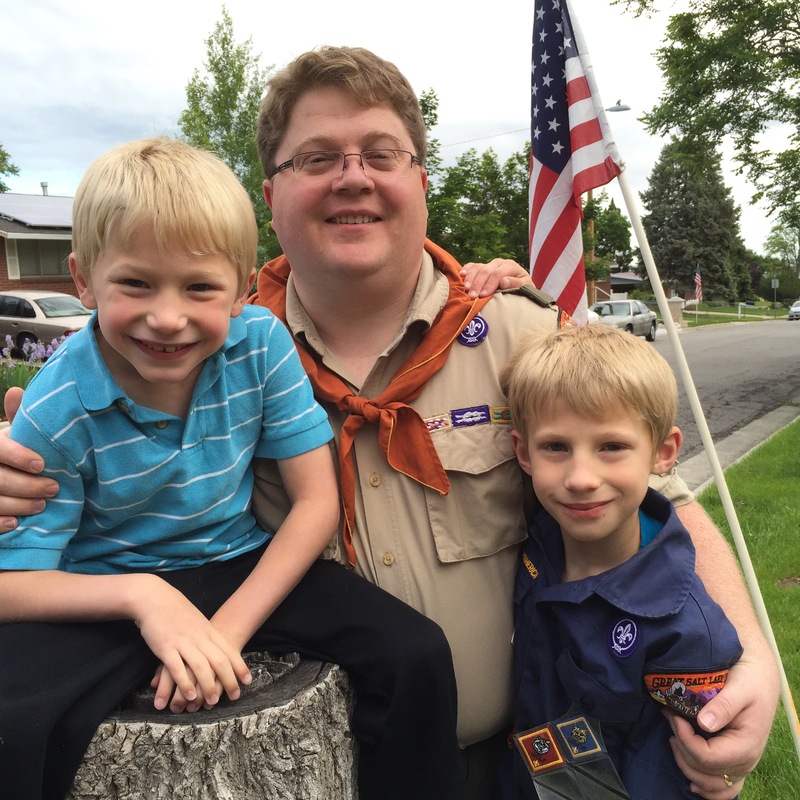 Just finished putting up flags around my neighborhood with my two oldest sons. (It’s a Cub Scout fundraiser.) I hope you have a meaningful day. You might try out FamilySearch.org for finding out more about your ancestors today. I admit I’m biased. I’ve written code there. I was fortunate to attend NGConf in my home town: Salt Lake City. It wrapped up Friday night. I can’t add much to all the resources that will be available at their site. Check out the videos on YouTube. I’ll report my sense of the conference and some personal highlights. The recurring message of the conference was that Angular is going to support you. This started with details about the overlapping support plan for angular 1 and 2. The theme continued throughout the conference as people talked about animations, i18n, material, and mobile support.